Mosquitoes remain one of the most dangerous animals in the world. Their capacity to carry and transmit diseases such as malaria, dengue, yellow fever and Zika­­­­,­­ to name a few, results in excess of 1 million deaths annually1. Sustained mosquito control is crucial to preventing major disease outbreaks and achieving further reductions in the burden of mosquito-borne illness. Unfortunately, the effectiveness of conventional control strategies is increasingly challenged by globalisation, global warming and escalating drug and insecticide resistance. As a result, there is increased interest in novel methods of vector-borne disease control. 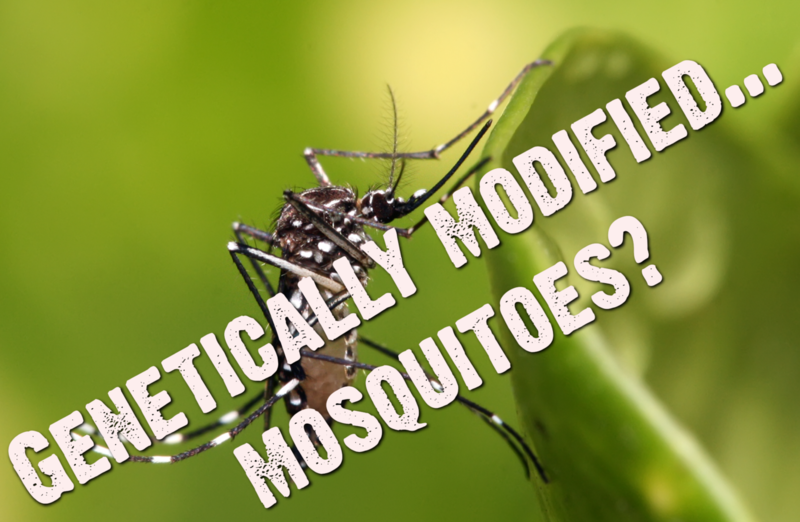 One method gaining increased traction is the release of genetically modified (GM) mosquitoes. There are several approaches to this strategy, however, at present these can be broadly split into ‘population suppression’ or ‘population replacement’ techniques. Population suppression aims to significantly reduce the size of mosquito populations so that fewer mosquitoes are around to transmit pathogens. On the other hand, population replacement involves replacing wild populations with GM mosquitoes that possess traits which reduce their capacity to transmit pathogens2. In recent years, the former approach has been trialled as a novel method for control of Aedes aegypti, a prolific vector of dengue, Zika, yellow fever and chikungunya. In a modern take on the sterile insect technique, GM ‘sterile’ Ae. aegypti have been developed and released at test sites in Panama, Malaysia, the Cayman Islands and Brazil since 2009. These GM mosquitoes possess a lethal, self-limiting gene which they pass onto their offspring when they mate with wild females. This gene causes female offspring to die before they reach adulthood, whilst male mosquitoes, which do not blood-feed or transmit disease, survive and pass this lethal trait onto future generation3. In theory, as fewer females emerge, the wild mosquito population crashes causing a concomitant decrease in disease transmission. Results from the aforementioned field trials appear promising. 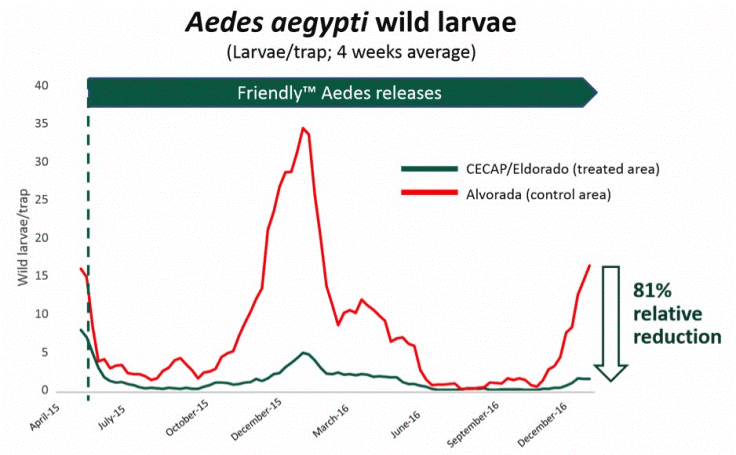 In Brazil, GM mosquito releases were associated with an 81% suppression of wild Ae. aegypti within trial zones4 (Figure 1). Similar results have been reported following releases in Panama and the Cayman Islands5,6. Unfortunately, this technology only remains effective for the first generation of mosquito offspring. In other words, to achieve sustained suppression of wild Ae. aegytpi, millions of GM mosquitoes need to be released repeatedly. Alternative approaches to GM mosquito releases based on use of gene drive systems could, in theory, overcome this limitation. Whilst the concept of gene drive is several decades old, the recent development of the CRISPR-Cas9 gene editing technique has made engineering gene drive organisms simple and inexpensive. Gene drive systems spread specific genes through a population by distorting normal Mendelian inheritance. In Mendelian inheritance, genes have a 50% chance of being passed onto offspring, whereas gene drive systems ‘cheat’ this to ensure genetic traits are inherited by offspring more than 50% of the time7. In the context of mosquito control, they may be used to spread pathogen-resistant traits to achieve population replacement or lethal traits to achieve population suppression. In theory, this means a wild mosquito population could stop transmitting pathogens or be driven to extinction following the release of a relatively small number of GM individuals. In August 2018, the Burkina Faso national biosafety authority granted permission for scientists to release up to 10,000 gene drive Anopheles gambiae; the mosquito primarily responsible for transmission of malaria. Whilst these mosquitoes will not carry any traits related to malaria transmission, scientists hope to learn more about the impact of their technology and improve perceptions amongst local communities and regulatory authorities. The release is hoped to be the first of many steps in a broader project to eliminate malaria in the region8. Use of GM mosquitoes may still be in its infancy, however, it is possible that this novel technology will play an increasingly important role in curbing mosquito-borne diseases in the future. A global brief on vector-borne diseases. (2014). Alphey, L. Genetic Control of Mosquitoes. Annu. Rev. Entomol. 59, 205–224 (2014). Alphey, L. et al. Genetic control of Aedes mosquitoes. Pathog. Glob. Health 107, 170–179 (2013). Carvalho, D. O. et al. Suppression of a Field Population of Aedes aegypti in Brazil by Sustained Release of Transgenic Male Mosquitoes. PLoS Negl. Trop. Dis. 9, e0003864 (2015). Gorman, K. et al. Short-term suppression of Aedes aegypti using genetic control does not facilitate Aedes albopictus. Pest Manag. Sci. 72, 618–28 (2016). Harris, A. F. et al. Successful suppression of a field mosquito population by sustained release of engineered male mosquitoes. Nat. Biotechnol. 30, 828–830 (2012). Alphey, L. Can CRISPR-Cas9 gene drives curb malaria? Nat. Biotechnol. 34, 149–150 (2016).